A dynamic and effective enforcement counsel, Neal has represented financial services clients in many of the SEC’s major Wall Street investigations in the past 15 years, including anti-money laundering, insider trading, the sale of auction-rate securities, other structured products and various subprime mortgage-related matters; mutual fund market timing. He has represented public companies and accounting firms in connection with SEC investigations and proceedings related to audit work papers, accounting treatment of assets and valuations, compliance with Regulation FD and accounting treatment in connection with M&A. Neal is also one of the leading advisers to the securities industry on major compliance and regulatory matters. He has played a central role in many significant matters over the past 20 years, such as representing Freddie Mac in a multi-year investigation by the SEC and the DOJ regarding sub-prime mortgages, representing Morgan Stanley in obtaining regulatory approvals for the 2009 launch of Morgan Stanley Smith Barney, the country’s largest retail broker-dealer and in its subsequent move to self-clearing and the Boston Options Exchange’s 2012 filing with the SEC to become a national self-regulatory organization. He represented the settling banks in negotiating the NASAA model settlement that become the basis for the Global Settlement Relating to Firm Research and Investment Banking Conflicts of Interest announced by the SEC, NASD, NASAA, NYSE and the N.Y. Attorney General’s office in April 2003. During his tenure as the executive director of the North American Securities Administrators Association, he represented the 53 states and territories in negotiations concerning The National Securities Markets Improvement Act of 1996 and was one of the principal drafters of NSMIA. He also served as chief of the Massachusetts Securities Division and was vice president of regulation at the Boston Stock Exchange. Neal appears regularly on industry and legal panels that address issues of concern to the securities industry, including the SIFMA C&L annual meeting and certain SIFMA regional meetings. He has co-chaired the Fall PLI course on broker-dealer regulation annually since 2007. He also speaks at FINRA’s fall and spring annual conferences. He has appeared before the U.S. Congress to provide testimony on various SEC proposals and proposed federal oversight of the U.S. capital markets. 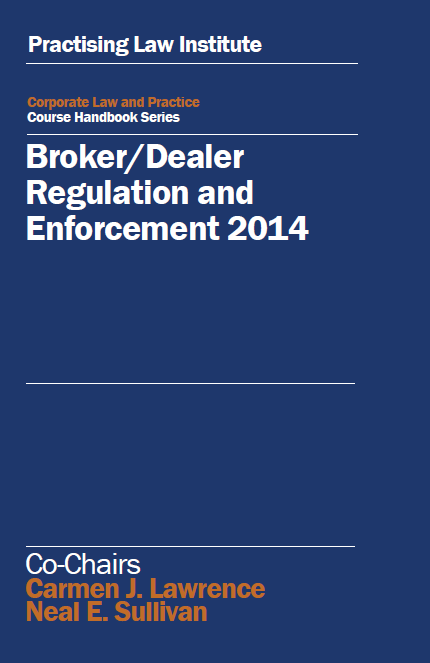 He has authored several published articles on regulation of broker-dealers. Carmen Lawrence is a partner in King & Spalding’s Special Matters and Government Investigations practice group. Ms. Lawrence's practice focuses on representing parties in investigations and litigations conducted primarily by the US Securities and Exchange Commission, US Commodity Futures Trading Commission, US Department of Justice, self-regulatory organizations and state securities regulators, conducting internal investigations, providing crisis management advice to public and private companies and counseling public companies and regulated entities (broker-dealers and investment advisers) on their obligations under the federal securities laws. From 1996 until June 2000, Ms. Lawrence was the Regional Director for the SEC's Northeast Regional Office (covering 14 states and the District of Columbia), where she oversaw all enforcement and regulatory operations in the SEC's largest region. Some of the SEC's most significant cases were brought by the Northeast Regional Office under Ms. Lawrence's leadership. Before her appointment as regional director, from 1990 through 1995, Ms. Lawrence served as Senior Associate Regional Director, heading up the Northeast Regional Office's Enforcement Division. From 1981 to 1989, she served in various staff and senior positions in the Enforcement Division. Ms. Lawrence received numerous awards during her tenure at the SEC, including the Equal Employment Opportunity Award in 1998; the Presidential Distinguished Executive Award in 1995; the Stanley Sporkin Award in 1993; and the Irving M. Pollack Award, presented to an enforcement lawyer exhibiting leadership, integrity and intellect, in 1990. Ms. Lawrence is consistently recognized by Chambers USA: America's Leading Lawyers for Business as a leading individual for Securities Regulation and for Litigation: White-Collar Crime & Government Investigations. She is consistently recognized by Legal 500 in Litigation: White-Collar Criminal Defense, and is additionally recognized in Financial Services: Litigation. She is also consistently recognized by Benchmark: Litigation as a New York Litigation Star. She was named to Securities Docket’s inaugural “Enforcement 40” list of top SEC enforcement lawyers in 2013. Ms. Lawrence has spoken extensively and participates in numerous continuing legal education programs for federal securities law matters.